Factual error: Ashley Judd is convicted of murdering her husband for the insurance money and that would make it a first degree murder charge (first degree meaning she planned the murder). Because of that there is no way she would have been eligible for parole after just 6 or 7 years. Suggested correction: It's never stated that she was charged with 1st degree murder, nor that she killed her husband for the insurance money. It was only brought up in trial as motive. Nick's accident was ruled "wrongful death" and the fact she did get paroled further show she was never convicted of 1st degree murder. Plot hole: For a convicted murder who violated her parole and assaulted her parole officer while escaping custody Ashley Judd moves around the country and even boards airplanes with little to no problems. Suggested correction: She was simply careful. There's constant manhunts for much more serious felons and parolees on the lam who seem capable of moving around without getting caught. How did she keep the gun if she flew across the country? 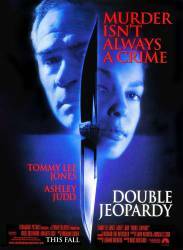 Other mistake: On two occasions in the movie, Ashley Judd slams a car into another (she drives Tommy Lee Jones' car into another and over the side of the ferry boat, and later she smashes a stolen pickup truck into the side of a car). In each case, the car she is driving emerges from the crash without a scratch on it, not even a damaged headlight.